The VWR Lab Stirrer comes with Aluminum platform and magnetic drive belt. These easy to use stir plates run on standard 115V powerr and is small enough to fit on any lab bench. The analog dial allows the user to quick change the speed of the lab stir plate from 60 to 1600 RPM. 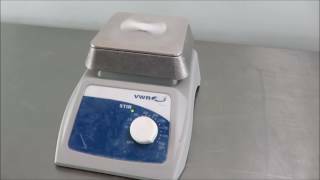 Contact us today to learn more about our used VWR Lab Stirrer. Dimensions 10" x 7" x 4"
The VWR Lab Stirrer comes fully tested and backed with our standard warranty. If you have any questions about our used lab instruments please feel free to give us a call.